A central theme in Wordsworth’s epic blank verse ‘autobiography’ or history of the development of the poet’s mind, The Prelude, is that our identity and character are shaped by what he called “spots of time”. These significantly punctuate our lives, providing a “renovating virtue” by which “our minds / Are nourished and invisibly repaired.” They usually occur in the poem as an epiphany experienced arising from an incident or sight in the natural world. A School-boy Traveller, at the Holidays. Than I unloos’d her tether and embark’d. Back to the Cavern of the Willow tree. By day and were the trouble of my dreams. The location for this incident is usually identified as Black Crag, west of Ullswater in the English Lake District, Cumbria, which would have been seen behind the nearer ridge, Stybarrow Crag; the ‘huge cliff’ as Glenridding Dod; Mary R. Wedd suggests an alternative site near Blowick; the ‘huge cliff’ would be Place Fell (The Wordsworth Critic, 11 : 248). Watercolour of Stybarrow Crag by James Barrett (fl. 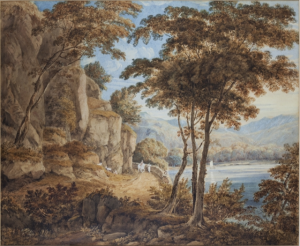 1785-1819), from the Wordsworth Trust online collection. Their blog at the same site is highly recommended: plenty of useful essays on Romanticism in general, and Wordsworth and his circle in particular. Rudimentary analysis of this extract at this site. This site has an analysis of the extract and a handy pen drawing of the topography of the scene. The BL site has an interesting illustrated piece on a text by T. H. Fielding and J. Walton, who spent two years in the Lake District making drawings and collecting information and ‘extracts from admired poets’ to produce their magnificent A Picturesque Tour of the English Lakes, Containing a Description of the Most Romantic Scenery of Cumberland, Westmoreland, and Lancashire…(London, 1821). The text and beautiful design and illustrations indicate that this was a book for dedicated tourists wanting to plan informed tours of the area. The book contains forty-eight hand-coloured aquatints made from the original drawings by Fielding and Walton. There are several references to Wordsworth and locations referred to in his poetry, including this boating scene.